The Bishop of Lira Diocese has said the refurbishment of the multi-million redesigned Lira Cathedral Church and the Bishop’s residence as a planned activity for the Golden Jubilee of Lira Diocese, should be the centre of unity among people regardless of their denominations. Rt. Rev. Joseph Franzelli made the remarks during the architectural presentation and approval of the new design for Uganda Martyrs Lira Cathedral Church drawn by Architect Palmer Adero Gae of Envirotec Consult Entebbe. He said work on the Cathedral is already attracting many players; professionals and non professionals alike who are making positive sacrifices to ensure that the work is well done and completed in time for the celebration in July 2018. President Yoweri Museveni is expected as the Guest of Honour for the Golden Jubilee grand fundraising event scheduled on Saturday 18th November 2017 at Akii Bua Stadium. The Bishop emphasised to the technical committee to take care of some of the important physical marks on the original church building, like the paintings, to remain as historical signs for the generations yet to come. To ensure that they complete their work in time, the Bishop also emphasised the need for work plan executed in phases. In their presentation, after a site inspection of the Church building, the engineers led by Architect Palmer Adero Gae and Engineer Moses Okwel of M&E Associates Ltd Consulting Engineers, assured the Bishop that the work on the Cathedral shall last only six months. Among the important features that shall be protected during the construction is the tomb of the first bishop of Lira Diocese, Ceaser Asili among others. The church is also to be expanded from the current sitting capacity of only 560 people to about 1,000. Eng. Okwel said their findings show that the existing walls of the church are still firm but shall require some soil testing for the foundation of the extension of parts of the building. Among other members of the technical committee in the meeting were Engineer Ongalla Geoffrey as Chairman, Eng. Bright G. Okuk Owera, Eng. Enon Richard Okello, Eng. Olwal James and Langoltum Peter of Uganda Technical College Lira. 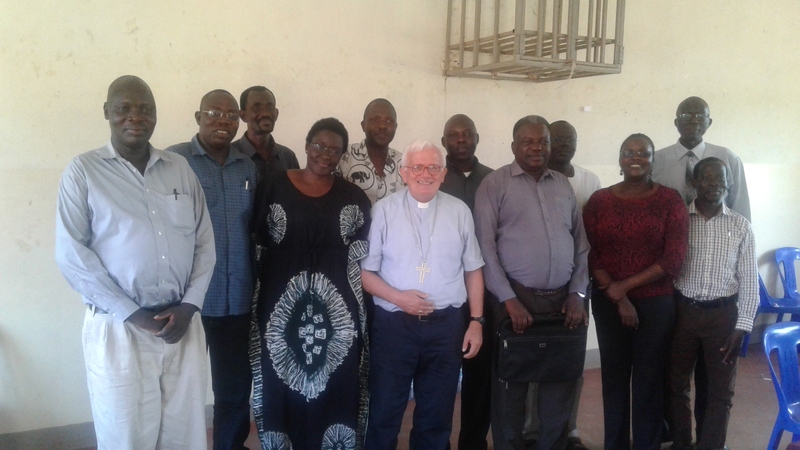 It was also attended by the Vicar General of Lira Diocese, Rev. Fr. Desiderius Pule Olima, the Bishop’s Secretary Rev. Fr. Polycarp Opio, Curate of Lira Cathedral Rev. Fr. Walter Ojuka, the Chairman Fund Raising Committee Mr. Ben Ogwang Ochoo and Chairman Finance Committee Mr. Ogema Awany, among others.